Sexton's Sojourn: A New Me Via DDP: Victims? Aren't We All? On January 4, 2013, I did it. And when I say I did, I mean I really did it! 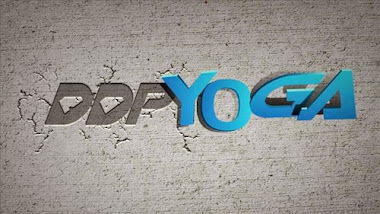 I jumped into DDPYoga head long! I jumped right in the deep end! I figured since I knew how to swim, it was going to be all good. I started working out EVERY day! I began eating gluten-free. Even though the weight started coming off almost immediately, it still just didn’t seem quite fast enough. Before I knew it though, I had lost 37 pounds! 37 pounds! I lost 37 pounds in four months! I couldn’t believe it. Holy crap! That’s a lot of weight in four months. More important than a loss of weight equal to my four year old child was how I felt. For the first time ever after starting some kind of weight loss program, I actually was feeling better. Any idea how much MORE that accounts for than just pounds lost??? And, I felt great actually. It was awesome! I was like a freaking Energizer bunny! I was working out every day, working full time, taking care of my five children, smiling the whole time, and NOT hurting! I was waking up practically every morning pain free. It was phenomenal and the best I had felt in years. I gave up Diet Dr. Peppers about a month or so in to working the program. A few months later, I followed that with giving up cigarettes. My two vices in life were gone. Out the door. Done. And I was still standing. By the time I met DDP and Jake in Cookeville on May 4 at Slamfest, I was reeling with delight. I couldn’t wait to tell them both about my progress and how much they had inspired me to do everything I had been doing. It was an awesome meeting. It was literally everything I could have dreamed of and more. They were both so absolutely gracious and nice. I picked up brochures from DDP that night after I had told him how I had gotten my mom started, and had a few more people were coming on board. I was just excited. I literally felt high, and I was just high on life. I felt unstoppable. Shortly after Slamfest, I learned there would be an Ultimate Workshop in Atlanta. I talked to my husband about going. I really wanted to go because I felt I needed the boost. For some unknown reason, I started losing steam after Slamfest. Not excitement, not desire, I was just literally running out of steam. At the risk of sounding melodramatic, I quite simply could feel the energy leaving my body. Like dew evaporating in the morning sun, once again, some unseen force was sucking the life blood right out of me. Damn. I really thought I had it this time. Forget those ignorant confession pages, cause here goes mine: I picked up the Diet Dr. Peppers again. I was struggling so hard in the afternoons to stay awake at work, I started drinking them for the caffeine pick up to get me through the rest of my work day. When I went from plateau to gain, I picked the smokes back up, too. All I could think about was the few hundred calories it would burn. Short term trade off worth it? I doubt it. But, here I am. I also withdrew from teamddpyoga as well as my blog in part to a lot of craziness that is my life. Definitely not because I was too ashamed to admit my transgressions, but because I just didn’t want to be a drag. Even before DDPYoga, I preferred to be a positive person. After DDPYoga, I was a positive person ALL THE TIME. Literally. I like being that person and I didn’t want to burden anyone with the person I felt I used to be. I don’t like feeling like a victim. I like acting the part even less. I only share what’s happened to me in the past as a means to communicate with and to relate to people: not to whine, not to look for sympathy; just a way to connect and understand. I try really hard to never pull the “victim card”. It’s not who I am. I do, however, frequently pull the “Hey, this is what I’ve been through just like you so we can BOTH get through it” card. That’s more my style. Victims? Yeah, aren’t we all “victims” of this life? We’re all familiar with the memes that cover that. Walk a mile in my shoes, don’t judge, DON‘T GIVE UP, etc. Yada, yada, yada. Don’t get me wrong. I love the memes. I post them ALL the time, but I want them to be inspiration for me to stay where I am or keep me moving another step on the road I’m going: Not to drag me up out of the depth of some God-forsaken, self-created, miserable little victim hole I crawled into. Ick. I.am.so.done.with.that.nonsense. Starting today, I’m working on score two. The score won’t change much from here. It’s going to look a lot like a low scoring hockey game score when it’s all said and done. Hole ain’t scoring on me anymore. I’m working on goal two and it’s game over for Hole after that. Victim? I don’t think so. We're looking at day one of the rest of my life, and I just killed Red Hot Core. It's on. Your determination to fight through is admirable. Especially with 5 kids. I have 2 kids under 2 and it's been a struggle for me. I fell off the wagon before the first one was born and it's been tough ever since. You'd think I pushed them out myself, but I'm a guy so my lovely wife did all that hard work. But I can relate to being pulled in many different directions. I added your blog to my tab "My Get Fit List/Blogs I Read"! Thanks for the support! We have to all hang in there together! Man. I have sooooo much to say about this post, but I don't think the best venue to express my thoughts is here. Victim can equal survivor. I hope my experience has taught you that. There is so much self-hate here, I'm whirling. I'm baffled as to how you can think of yourself that way. . . I would like it if you would re-read this post. I don't equate victim and survivor. It's all about mentality. I prefer to think of myself as a survivor rather than getting stuck in the mentality of "victimhood". I used to be a victim. You used to be a victim. Each of us for different reasons. I haven't thought of either of us as victims in a really long time. I re-read it, and I'm not sure what I was thinking last night. Blame it on insomnia & being all weepy & emotional?